These curtains are amazingly beautiful. I wanted them to match my comforter with silver I. It and they were perfect. I will be purchasing these again in another color. Dress up your windows with the look and feel of Dupioni silk without the price with this charming curtain panel. The plush fabric blocks harsh light and harmful UV rays, allowing a soft glow to filter through. Crafted with an interlining, the panel helps insulate your home and lower utility costs. The flowing design, opulent sheen, and silver grey color complement your home with refined elegance. I bought 7 panels of these to do a clients living and dining rooms and they are beautiful. Has texture like Duponi silk without the price. All are lined and weighted at the bottom and hang beautifully. 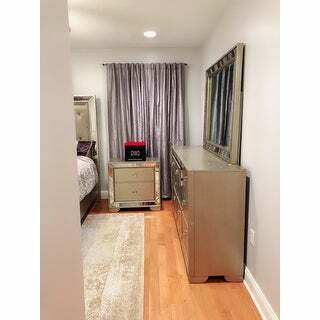 My partner and I wanted to use these curtains as a room divider separating our entry way/bathroom/kitchen area (Brooklyn railroad apt) from our bedroom area. 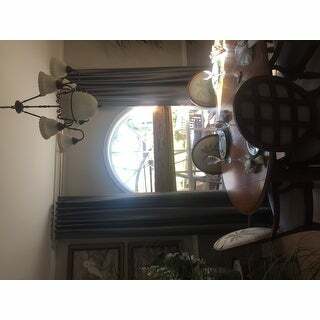 The curtains are just gorgeous and stunning---they go great with our silvery blue and ash white paint colors. Even though people on the entryway side see the back lining (white) of the curtains---they still look amazing---they block a lo of food odors wafting from our open kitchen and insulate a lot of heat from our radiators keeping our bedroom area toasty...the curtains look and feel like silk despite their 'faux' and more affordable materials. I am just livid at Overstocks descriptions of things. There curtains are green! My husband knew I had ordered silver, and even he asked why they were green when he saw them!!!! To top it off I bought 4 panels, and none are the same length. The longest is over a full inch longer than the rest, and the bottom of one is sewn curved so there is no way to get them to hang right. Nice fabric, but junky workmanship and description. The quality of these curtains makes them look like a million dollars. I love them, they are thick, heavy and well-made. I had to order a third panel as my window turned out to be too wide. I ordered these curtains for a window that overlooks a small lake. During the day, the curtains take on a slight blue/green sheen. The combination is beautiful. Love these faux silk curtains. I ended up going with a the darker panel option. These are luxurious, lined and have an insulating value without the high cost. I have kids and pets and didn't want to spend thousands on drapes on our homes many large windows - so happy these are available! Almost makes me wish I had more windows. Lovely curtain panels that look expensive but are half the price of Pottery Barn and other retailers. The sliver is elegant and has transformed the look of both my living space and bedroom. The lining/backing is substantial and effectively blocks light when panels are closed. I have used rings/clips to hang on the rod in my living space and the pole pocket for hanging in the bedroom. In both cases they move with ease. Highly recommend! I agree with other reviews: color is darker than the photo, the sheen of the fabric has a greenish color to it (I did not think it was too green). Maybe the sheen depends on the light in the room. In my office, the curtains definitely look gray. I wish they were the exact color that is shown in the photo. So if you are looking for medium grey, you will not be disappointed with these curtains since the quality is outstanding. If you are looking for "silver" lighter grey, these may not work for you. I took 2 stars off because I am losing a lot of money be returning them. Purchased panels for formal dining room. They look like real dupioni silk. Lined, insulated and has a nice weight to them, plus they have weights at the bottom. The color is a mid-light silver with a nice sheen. I'm so thrilled with these drapes! I've been looking for awhile but didn't want to pay top dollar (Pottery Barn) or settle for thin, cheap looking ones (most mall stores). Wasn't too sure about ordering on-line because I'm finicky about the thickness and texture. These look like top quality, expensive drapes - they're lined, heavy, well made, and the fabric is beautiful, not at all cheap looking. They're room darkening (not black-out) and insulating, which is what I wanted for my back slider door. Although they're heavy, I was able to hang them with clips from a pole rod. They look terrific next to my brown leather chairs and protect the chairs from direct sunlight. I love everything about these drapes - the color, texture, sheen, quality, and especially, the price. Such a great deal! I was worried the silver would be too light but this went perfect with my platinum shag rug. It's not an extremely light gray but more midtone. Also, great quality. Definitely needs to be ironed before hanging. These curtains are simply beautiful. They are made really nice and heavy and have a beautiful shine to them and we couldn't be happier. Makes our room look very elegant & relaxed. They also are room darkening when you need that or you can push them to the sides for a soft look. They look like a million bucks! We were disappointed by the color of the silver. It has a green hue to it and it was especially visible when we compared it to the other grays in our room. We returned the curtains. It will put a finish in my living Room! 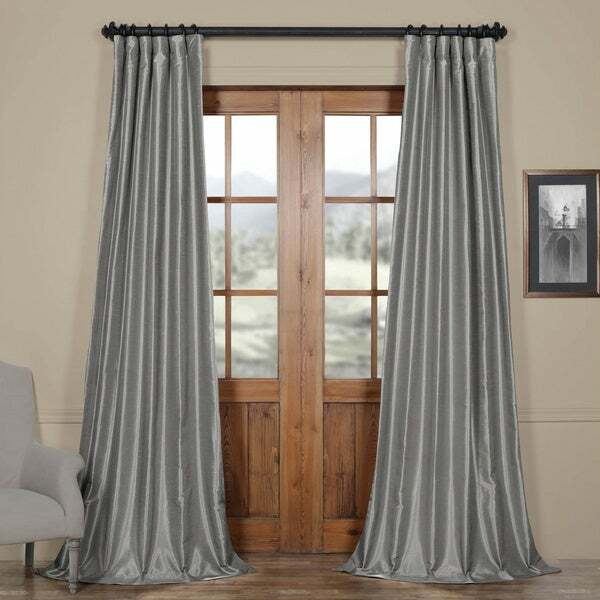 I ordered 3 sets of these drapes as well as another color/style, not knowing which set would match the best. The quality and thickness is absolutely beautiful! These are as nice as custom made drapes that you would find for three or four times the money. I ended up buying the other drapes because of the color, However, these are much heavier and more expensive looking. You will not be disappointed! These are my favorite all-time curtains! The photo satin is simply beautiful and they look wonderful in my living room. These curtains block the sunlight when closed but open easily to let the sunshine in. The fabric is shiny silky and they are lined in white. The color is perfect. These curtains look and feel very luxurious! They are lined and very well made. The silver grommets add a nice touch. I would recommend these drapes. These curtains are absolute absolutely gorgeous. "Can these be steamed or steam-ironed to remove the wrinkles, or will water damage the fabric?" "Is this curtain just one panel and I will have to buy two panels?" Yes it is a single panel. However they are heavy and lined with white fabric. My room is painted a blue gray and they look grey/silver in the room. I live in the South with strong sun and they seem to be black out to me. They are substantial curtains and look better to me than a lot of the pottery barn and restoration hardware panels. I was thrilled with them. 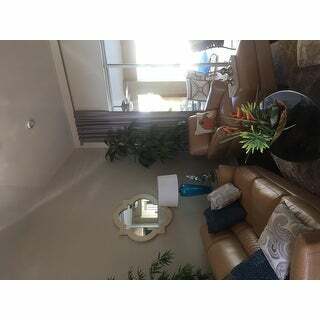 I also have 10 foot ceilings and bought the 120 inch length so they cascade like the pictures above. Cant say enough. Well worth the money. One panel. To get the look of the picture, you would have to buy two panels. "I wanted to find out if these are blackout curtains or just energy efficient --"
These are not blackout curtains. However, they do keep out quite a bit of the light. "Just received three of these curtains. Love the color but there is no back tab and mine are pinched into pleats that look nothing like the picture. Am I missing something!? Please help! " I ran mine through a pole and my girlfriend has them extra long so they drape on the floor, this is supposed to be the look according to her. I myself like more simetrical pleats. I'm not sure what would be different with yours but mine look just like the third photo on the site. You might ask a local draperies sales person their usually very helpful for free. "How do I hang these like the second and the fourth picture?" I have not seen any pictures but these are tab back drapes and I just slid a 2-3 inch round drapery rod through the tabs to hang the drapes on the rod. You could also use drapery pins at each pleat and at each end to hang the drape but then you need to have a drapery rods that accepts drapery pins. Easier to use the tabs. The tab back is just a more recent adaptation of the drapery heading known as pole top drapes. Hope that helps..
Just saw the picture. You have to buy a rod the comes with the rings on the rod and then you use drapery pins to attach the drape to each ring. More expensive rod. "Please can you tell me if item number 17767674 croscill everly ivory and platinum valence is a good match. I love both, but not sure if it will match. Thanks"
They are not the exact same match but they could go together. It really depends what you like. I hope this helps. "I'm curious how wide a panel measures?" Each panel is 50'' wide.